Last night Stuart and I had the pleasure of seeing the first preview of the world première of James Graham’s new play Labour of Love at the Noël Coward Theatre in London's glitzy West End. In case you didn't know, James Graham is an outstanding comedic playwright who manages to marry the political and the personal aspects of the human condition in a quite extraordinary way. Two other recent productions of his plays - This House and Ink - opened to rave reviews. And I believe Labour of Love will join them. It's a triumph. 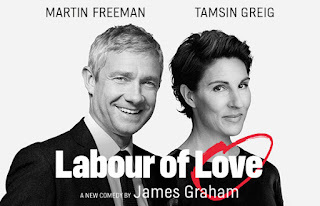 New Labour MP David Lyons (Martin Freeman) cares about modernisation and 'electability' his constituency agent, Old Labour Jean Whittaker (Tamsin Greig) cares about principles and her community. Set away from the Westminster bubble in the party’s traditional northern heartlands, this is a clash of philosophy, culture and class against the backdrop of the Labour Party over 25 years as it moves back and forward from Kinnock through Blair into Corbyn and beyond. The play is extremely clever as it develops themes of old vs new, pragmatism vs idealism, how to read things both backwards and then forwards, and all this with a razor-sharp wit. It's very rude too and not beyond a bit of board farce. A clever trick to pull off - that the Labour itself struggles with - to be all things to all people.